Boric Acid CQ, in an aqueous medium, is acidic according to the concentration, pH varies from 3 to 6. During the glass-melting process it has the characteristic of lowering the melting point. Additionally it has antiseptic properties preventing the formation of bacteria and fungi. Cellullose Boric Acid CQ reduces the flammability and thermal insulant cellulose, wood and stuffed with cotton. Allows preserving the cellulose from insect attack. Prevents material putrefaction. Leather Boric Acid CQ softens the leather and because of its anti-fungal properties keeps the leather free of microorganisms. Germ-free soft leather. Frits Boric Acid CQ is used in the manufacture of frits and ceramic glazes because the low melting temperature and fluxing properties. Ceramic coatings. Lower the melting point and increase the brightness of frits and ceramic glazes, besides giving them toughness and resistance. Glazes One of the components of glaze is the ceramic frit produced with Boric Acid CQ. Manufacture of hard surfaces, durable and easily washable, applied in washing machines, refrigerators, bathtubs, stoves, ovens, etc. Granular Boric Acid TQ, in an aqueous medium, is acidic according to the concentration, pH varies from 3 to 6. During the melting process (glass, glaze, metals, etc.) it has the characteristic of lowering the melting point. Additionally it has antiseptic properties preventing the formation of bacteria and fungi. Frits Boric Acid TQ is used in the manufacture of frits and ceramic glazes because the low melting temperature and fluxing properties. Ceramic coatings. Lower the melting point and increase the brightness of frits and ceramic glazes as well as strength and toughness. Glazes One of the component in glaze is the ceramic frit produced with Boric Acid TQ. Manufacture of hard surfaces, durable and easily washable, applied in washing machines, refrigerators, bathtubs, stoves, ovens, etc. Glass Boric Acid TQ plays a role in the glass manufacturing process. The boron oxide B2O3, resulted from the heating of the manufacturing components, forms links with the silicon oxide to reduce the viscosity of the melt mass and to contribute to the formation of the glass structure. High boron content glass improves brightness and thermal resistance. Thermal glass used for laboratory equipment, tubes, glasses, thermometers, etc. Kitchen accessories resistant to heat, trays for ovens, coffee pots, milk pots, vehicle headlights, etc. Lenses for illuminated signs and traffic lights, eyeglasses, cameras, etc. Fireproof Materials Boric Acid TQ is used in the manufacture of flame retardants such as zinc borate. Zinc borate releases water molecules during burning forming a glass layer of zinc borate significantly reducing the intensity of the flame. Fire resistant materials. It is commonly used in the manufacture of cellulose insulation. Its also used in the manufacture of “matches” to extend the duration of the flame. Textiles Synthetic fabrics uses flame retardants based on synthetic borates. These synthetic borates are produced with Boric Acid TQ. Fabrics with fire protection such as theatirical backdrops, decorative papers, fireproof suits, etc. Chemistry Boric Acid TQ reacts with oxides, hydroxides, amines, etc. forming other chemical products. High value-added chemical products. Fiberglass Boric Acid TQ is used to lower the viscosity of molten glass in the manufacturing of fiberglass. Products with thermal and acoustic insulation properties. LCD Screens Boric Acid TQ is used in the manufacture of LCD screens with a thickness of 01 mm approximately. The LCD screen is formed by two borosilicate glass films with the middle being a thin film which is an organic compound of intermediate physical state between solid and liquid. Laptop screens, visors, etc. 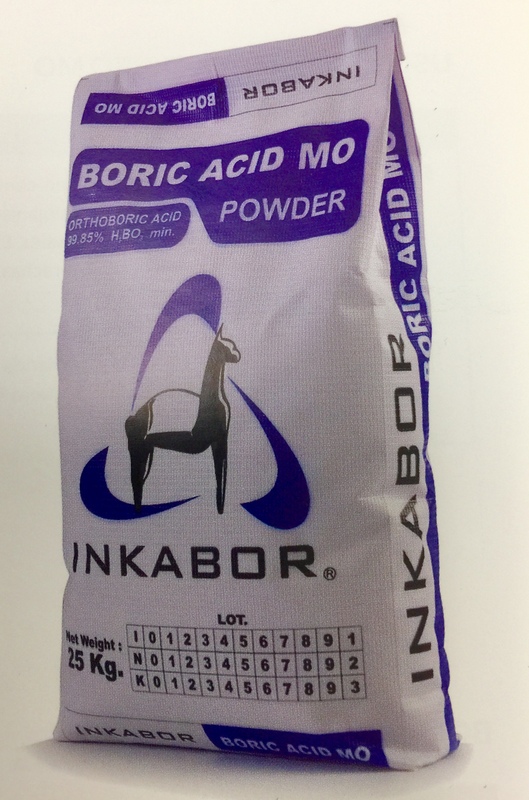 Boric Acid MO powder, in an aqueous medium, is acidic according to the concentration, pH varies from 3 to 6. During the melting process of glass it has the characteristic of lowering the melting point. Additionally it has antiseptic properties preventing the formation of bacteria and fungi. 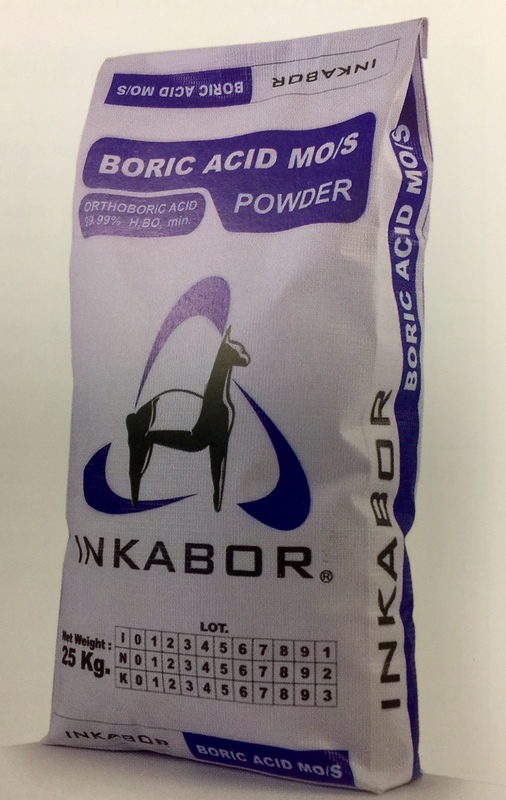 Boric Acid MO in adequate concentrations inhibits the growth of microorganisms such as fungi to plants and animals. It is part of the ingredients in baits (roach killer) to control cockroaches. Insecticides to free environments of microorganisms and cockroaches. Leather Boric Acid MO softens the leather and because of its anti-fungal properties keeps the leather free of microorganisms. Germ-free soft leather. Boric Acid MO/S powder, in an aqueous medium, is acidic according to the concentration, pH varies from 3 to 6. During the melting process of glass it has the characteristic of lowering the melting point. Additionally it has antiseptic properties preventing the formation of bacteria and fungi. Fireproof Materials Boric Acid MO/S is used in the manufacture of flame retardants such as zinc borate. Zinc borate releases water molecules during burning forming a glass layer of zinc borate significantly reducing the intensity of the flame. Fire resistant materials. Textiles Synthetic fabrics uses flame retardants based on synthetic borates. These synthetic borates are produced with Boric Acid MO/S. Fabrics with fire protection such as theatirical backdrops, decorative papers, fireproof suits, etc. Fungicide Boric Acid MO/S in adequate concentrations inhibits the growth of microorganisms such as fungi to plants and animals. It is part of the ingredients in baits (roach killer) to control cockroaches. Insecticides to free environments of microorganisms and cockroaches. Chemistry Boric Acid MO/S reacts with oxides, hydroxides, amines, etc. forming other chemical products. High value-added chemical products. 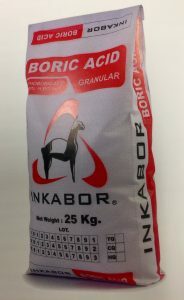 Boric Acid HQ granular, in an aqueous medium, is acidic according to the concentration, pH varies from 3 to 6. This is the high purity grade offered to the market. During the melting process of glass it has the characteristic of lowering the melting point. Additionally it has antiseptic properties preventing the formation of bacteria and fungi. If the need is for high purity orthoboric acid H3BO3 this product will meet that need.